25 Years Hand Analysis Research & Multi-Perspective Hand Reading! Decoding the Hand with Multi-Perspective Hand Reading! 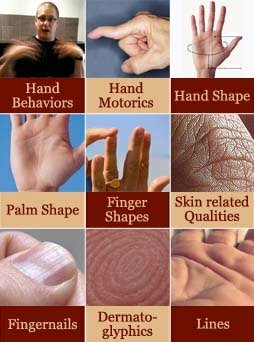 This site is focussed on decoding the language of the hand by means of Multi-Perspective Hand Reading, which exhibits the future of the fields covering palm reading & palmistry. Some of the underlying basics are outlined in this advanced Hand Reading Mini-Course. A collection of 50 Scientific Hand Charts is presented covering many Diagnostic Themes, including: the Big Five personality dimensions + major psychological-, psychiatric- & medical conditions. This site (which includes 1800+ pages) was build on top of 25 years hand reading research experience + combined with 350 hand reading news articles with materials collected around the world. An exclusive sitemap is also available with e.g. a listing of 34 major items of this site! Most of the contents of this site relate to the fields associated with the diagnostic practice of 'hand reading' - which is a.k.a. scientific hand analysis, psychodiagnostic chirology, chiromancy, chirognomy, predictive palmistry & medical palm reading. NOTE: Multi-Perspective Hand Reading is focussed on combining major hand sign variations, usually with the use of multiple dimensions of the hand). based on 300+ sites in 35 counties! 700+ experts in 54 countries! + many hands research studies! 250 Famous hands & celebrity hand readings!